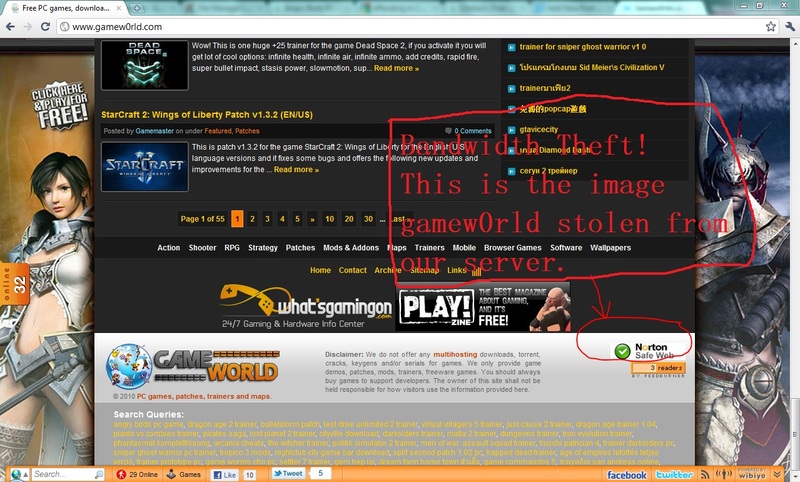 We would like to have your attention that http://www.gamew0rld.com/ has stealing our bandwidth by stealing our image http://www.rmvalues.com/images/norton-safe.gif by directly called the image from our site instead of copy the image and hosted on their own server. Their action is harming and offending our server and caused high CPU load in our server. And we are not tolerate with their bad attitude! Above image show the proof of the image they stolen our bandwidth. 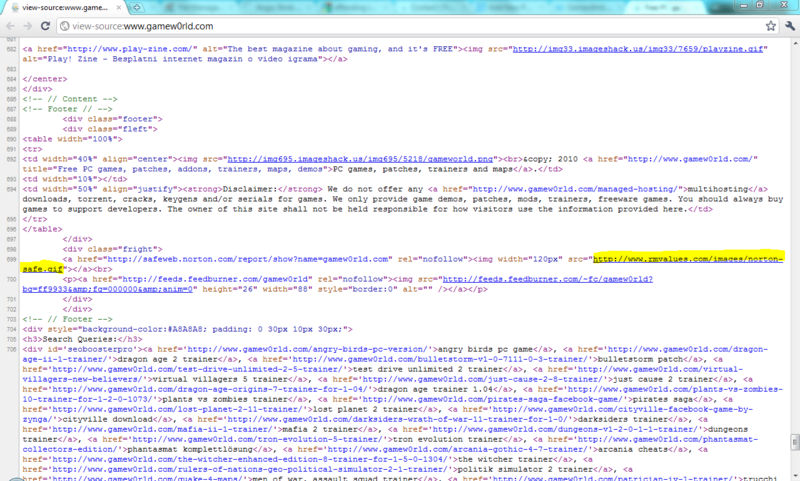 Above show the HTML source code of gamew0rld main site to proof that we have not wronged them. An email has been sent to their owner and we hope they will take serious action on this matter. According to whois information, this domain is registered via Tucows on 2010-05-17 but the owner details has been protected by whois privacy. This will be the first and last warning to gamew0rld owner as well as other webmaster, please do not steal any bandwidth from our site or we will not hesitate to publish and announce your name over here to make you become famous. If you have done so, please take action and remove it before we noticed your existence. This entry was posted in Events and tagged bandwidth, Bandwidth Theft, gamew0rld, high CPU load, Warning on April 29, 2011 by RMvalues. Are you sick of posting URLs in emails only to have it break when sent causing the recipient to have to cut and paste it back together? Then you should try URL shortening service. Today the URL shortening or forwarding service we would like to recommend to you is TinyURL. Easy to remember. You put a long URL in, you get a shortened version back. Try it yourself today and get your own tinyurl by visiting TinyURL website. This entry was posted in Free Stuff and tagged free service, hide url, short url, tinyurl, url forward on April 28, 2011 by RMvalues. I recently saw a lot of my friends share a video in facebook on how to defend and protect yourself from sexual abuse. Although the explanation is in Mandarin, but you can easily understand without listening. Because it show and teach you step by step on how to protect and defend yourself in several conditions, such as in front, side, from back and so on. This video is short and about 3 minutes and 13 seconds. This entry was posted in Safe Info and tagged defend, molest, protect, sexual abuse, video on April 18, 2011 by RMvalues.